The venue is Kasturi Srinivasan Hall, The Music Academy campus. Discussions open to audience after comments from the Experts Committee members. 8.05 am - 8.50 am - Priyasri Rao : Textual Traditions in Indian Classical Dances. 9.00 am - 10.00 am - Bombay Sisters C. Lalitha and C. Saroja : Tyagaraja’s popular krti-s in rare raga-s and rare krti-s in popular raga-s.
Sri Krishna Gana Sabha's Naatya Kala Conference(NKC) is a very important event during the Chennai Art festival season in December. The 30th annual NKC will be held between Dec. 26 and 31, 2010. Senior dancer and guru Shanta Dhananjayan will be the convener for the 30th & 31st NKC. (for two years). This year's conference will focus on the Abhyaasa-Sampradaaya (evolutionary developments in the last century ) culminating in today's repertoire and presentation of the five major system of traditional Naatya namely Bharatanaatyam, Kathakali, Kuchipudi-naatya, Odissi-naatya and Kathak-naatya. A living legendary Achaarya will lead each deliberation. Each day is devoted to one style which will focus on educating and enlightening the commoner and connoisseur to appreciate these performing art forms in greater in-depth. Particularly the critics , reviewers and students could enhance their understanding and appreciation level. On the concluding day (Dec 31st) whole session will focus on FUNDING CLASSICAL ARTS and how to go about getting funds. Representatives from Government Funding Bodies, Corporate Bodies, Sabhas, will talk and answer questions on the availability and procedure to get funds and opportunities to perform and foreign tours etc. This is envisaged to help various Artistes, Art Institutions, schools, Cultural Organisations etc. Individuals, organized groups, Institutions are required to register themselves as Conference delegates to facilitate designated seat allotments and participate in the discussions and get free refreshments. The Sabha and the convenor of NKC also invite relevant articles /suggestions/fresh ideas/opinions concerning the performing arts , to publish in the souvenir to be released on 31st Dec. Restrict the articles/suggestions etc to ONE page (a4 size page) and a passport size photo and four lines Bio-data must be accompanied. A special Editors, Jury will select the best journalistic written materials for publication. The jury will also select the best among them for a surprise award. Maharajapuram Santhanam Road ( Old Griffth Rd, T.Nagar, Chennai.600017. 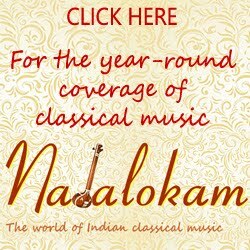 As a prelude to the Margazhi Mahotsav, Bharat Kalachar hosts during December - January every year, a short festival welcoming Margazhi is also hosted by them in November. This series encourages the young talents. Venue: Bharat Kalachar, Sri. YGP Auditorium, 17, Thirumalai Pillai Road, T. Nagar. The official website can be read here. Carnatica's Bharat Sangeet Utsav sets the music season on! Carnatica, a website and organisation comes up with Bharat Sangeet Utsav every year in November. This year the fest is happening at Chennai and Bangalore. 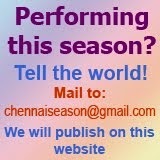 The Chennai events will be held from Oct. 29 to Nov. 9. One of the first sabhas to release the concert schedule for the upcoming December Season is Sri Rama Bhaktha Jana Samaj. The concerts are held at PADMA SESHADRI SCHOOL AUDIORIUM, Alagirisami Salai, KK Nagar, Chennai-78. The annual Music festival of Narada Gana Sabha will be held from December 15, 2010 to January 2, 2011 at Sathguru Gnanananda Hall, TTK Road, Alwarpet. The Mylapore Fine Arts Club has announced its prestigious annual awards for 2010. Nungambakkam Cultural Academy hosts the longest ’season’ every year. The events are held at Ramarao Kala Mantap, Habibullah Road, T. Nagar. Lifetime Achievement Award - Padma Subrahmanyam – Bharata nrityam. (The award carries a gold medallion, a citation and a purse of Rs. 25,000). R. Krishnasamy (contribution to fine arts). Each award carries a citation, a gold medallion and a purse of Rs. 5,000. Kartik Fine Arts Society is yet to have its own auditorium to hold its events. During the season, they host the concerts in Narada Gana sabha, Bharatiya Vidya Bhavan and later as a Tamil music festival at Valliammal College for Women in Anna Nagar.